Reports are out that Google Base will be launching soon, perhaps even today. Dirson has a screen shot up on Flickr and additional images are on Wouter Schutâ€™s blog. Google Base appears to be a service to publish content directly to google and have them host it in a centralized way. If so, this would be going completely against the accelerating trend of decentralized publishing. My prediction: when the dust settles, this will either be largely ignored or universally hated. Centralized content is boring…so much is going on at the edge of the web, why would anyone try to put it all back in the center? Post your items on Google. Google Base is Googleâ€™s database into which you can add all types of content. Weâ€™ll host your content and make it searchable online for free. 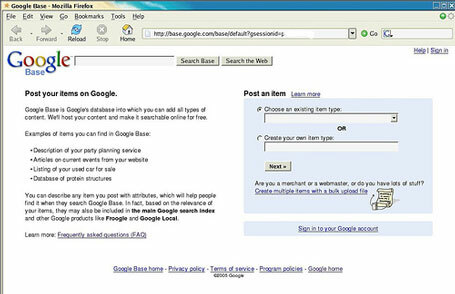 You can describe any item you post with attributes, which will help people find it when they search Google Base. In fact, based on the relevance of your items, they may also be included in the main Google search index and other Google products like Froogle and Google Local. You may have seen stories today reporting on a new product that we’re testing, and speculating about our plans. Here’s what’s really going on. We are testing a new way for content owners to submit their content to Google, which we hope will complement existing methods such as our web crawl and Google Sitemaps. We think it’s an exciting product, and we’ll let you know when there’s more news.